A candle burns for all mistreated and abused animals. 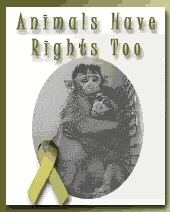 Join the Internet candle vigil against animal violence. Take the above candle to your website and help spread the word. The Killing for Kindness Campaign is for a federal law for the humane euthansia of surplus, homeless companion animals. THANK YOU FOR VISITING AND PLEASE DO COME BACK AGAIN SOON!